Blog Cannonborough and Elliotbrorough in the News! Cannonborough and Elliotbrorough in the News! More notoriety for the local foodies of the neighborhood. 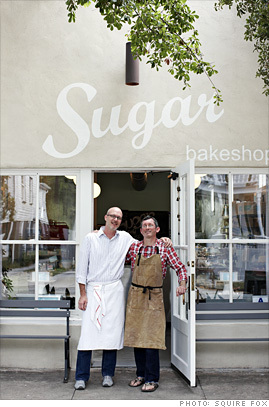 A wonderful article in CNN Money online called “Indie Charleston” featured our local bakery Sugar. Here is what they said and the great photo they ran, taken by Squire Fox of owners Bill and David who live next door to their charming shop. North and South meet at Sugar Bakeshop, where two former New York City architects — Bill Bowick and David Bouffard — have been winning hearts and satisfying everyone’s sweet tooth since 2007 with their ginger molasses cookies, almond buttercream cupcakes and seasonal fruit tarts. In their first year of business, the pair snatched a spot on Bon Appétit’s “Best of the Bakeshops” list.